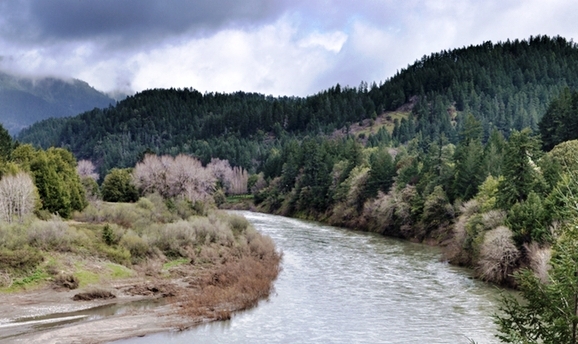 Coquille River after a little rain! The Chinook angling on the Coquille River starts in late July. The Coquille River has an early run of spring Chinook with decent numbers staying in the lower tidal territories through July and mid August. The waterway has a tidal range of forty-four miles. In late August and early September the Chinook begin to head up river and a few week later the coho begin to arrive. The run generally starts to improve through August and peaks in September but salmon can be in the river until mid November. Winter Steelhead fishing on the Coquille river is also a big draw northwest anglers. The Coquille like the Coos is known for big fish decent runs of both wild and hatchery fish. The Winter Steelhead run usually fires up in December and peaks in January. After January the run begins to taper and dies off in early March. The Coquille is generally open for Chinook salmon July. 1-Dec. 31. and year round for adipose fin-clipped steelhead. This fishery generally allows 2 adult salmon or steelhead per day, 20 per year. 5 jack salmon per day, 2 daily jack limits in possession allowed. one additional adipose fin-clipped steelhead may be retained per day for a total aggregate of 3 adult fish harvested daily from Jan. 1-April 30 and Dec. 1-31 only. One single point barbless required. Roe, shrimp, worms, and bait fish at the mouth. Top Recommendation for this location is plunking or drifting sand shrimp or eggs. Covering water with spinners and spoons or twitching jigs.